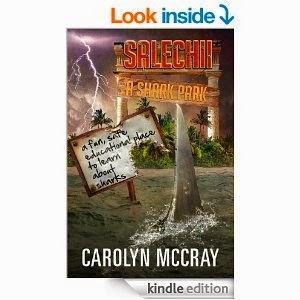 Take one part Jaws, mix one part Deep Blue Sea, a dash of Jurassic Park and a whole lot of mind-reeling excitement and you have Salechii by Carolyn McCray. McCray mixes some of the best elements of these stories while creating something 100% original in her story of a shark park about to open to the public when things start going terribly wrong. Building off such a simple premise, McCray develops a tale of suspense that will leaving you racing for the last page to see what happens. The rise and fall of action continue to build throughout the story like a rollercoaster ride through shark infested waters. McCray masterfully paces out the action and creates a landscape of peaks and valleys in her story until she reaches the apex of her mountain and sends us rushing down the side of an Everest of a tale. Throughout the entire story, from the moment the terror starts to mount, we find ourselves cheering for the characters and hoping to see them make it out in one piece. McCray provides us with characters that we are clearly meant to either love or hate. Most of the characters wear their motivations out in plain sight for all to see. Despite this lack of three-dimensionality in the characters, McCray provides us with enough of a range of humanity to still feel invested in what happens to each one of them by the end of the book. In a way, this is refreshing. The book serves as great entertainment without taking itself TOO seriously. Instead of getting bogged down in complex characters that slowly reveal their nature, McCray focuses on the horror of what is going on around them. I would urge that you not take this to mean that the characters are cardboard cutouts, because they are not. We are given enough to cheer for the characters (or the sharks) in every scene without the need to overanalyze every action of every character. The best characters in the story, however, are definitely the sharks. McCray seems to have done her research prior to writing this book. As an avid Shark Week viewer, I was pleased to see all the detail that is given to the sharks and the way they look and behave. While liberties are taken here and there for the sake of story, most of the shark-related facts are accurate. They are presented as truly magnificent animals that are deserving of our respect. At the same time, we see the terror that they could be. For me, sharks have always held a weird fascination. Nothing scares me more than the idea of being in the middle of the ocean, completely out of my element, and seeing that fin break the water. McCray creates that exact sense of terror through her sharks. Overall, I found Salechii to be a great read and a highly entertaining story. The story flow is fantastic and it is a book that you will not want to put down once you start. If you are a fan of shark fiction, I highly recommend this book. Overall –4.5/5 – Read this book now, but make sure you are on dry land when you do so!